Mythic Beasts Review 2019: Is Mythic Beasts a Good Hosting? Mythic Beasts is an internet service provider located in the United Kingdom. They are a longstanding company which has grown from one single server to multiple worldwide locations. Founded in 2000, Mythic Beasts is an internet service provider based in the United Kingdom. They have servers in multiple worldwide data centers and have grown from a single machine to hundreds of servers worldwide. Whilst they don’t advertise how many customers they currently have, they have continually grown their infrastructure, which suggests plenty of customers trust them. Their website and support are available in English. Mythic Beasts offers a variety of website hosting packages including WordPress hosting, shared hosting, dedicated servers, colocation, and virtual private servers. They also offer SSL certificates and domain registration. In terms of their regular shared hosting website plans, Mythic Beasts offers four simple plans – Standard, Plus, Super, and Jumbo – with disk space increasing from 5 GB to 150 GB and bandwidth increasing from 25 GB to 750 GB (depending on the package). All plans come with unlimited domains, which is a really nice value-add, but there is no explicit uptime average or guarantee (which is unusual). Also, unlike other providers, this provider’s WordPress plans are pretty prominent. The three plans – Shared, Business and Enterprise range from 10 GB to 8TB in disk space, as well as including free setup and 24/7 monitoring. Experts will love the SSH access, PHP support, and MySQL databases. Beginners will enjoy the one-click installer for popular programs such as WordPress, Joomla, and Drupal. 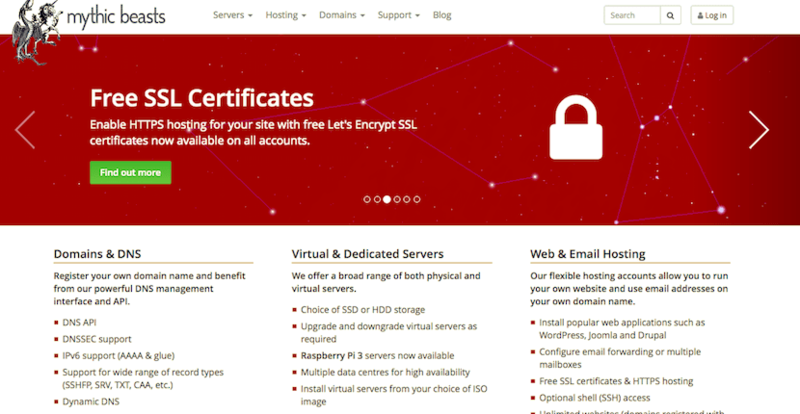 All plans come with SSL certificates included. Mythic Beasts has servers located in multiple worldwide data centers including three in London, one in Amsterdam, and one in California. They have a fully autonomous network, and all data centers have UPS systems backed by generators. Mythic Beasts’ bottom two packages for standard website hosting are acceptably priced compared to local and international competitors, but the top two plans are quite pricey. Similarly, the WordPress hosting is very expensive, although it comes pre-installed, is fully managed and backed up, and is monitored 24/7. You can pay for plans monthly, quarterly, or yearly. While you pay less when you commit more, you might still like to start with a slightly more expensive no-obligation monthly plan because they do not offer a free trial or money-back guarantee. At the checkout, you can choose SSH access for a small additional monthly fee. Domain registration also costs extra, but SSL certificates are included free-of-charge. Customer service is very limited. There is an email address for sales and technical queries, but they do not have live chat or telephone support. Nevertheless, I have been pleased to receive rapid and cheerful responses to my email enquiries, and I was happy to see a well-populated Twitter feed with a server status section. Mythic Beasts is a longstanding provider of internet services. They have some great products for beginners, and they have dedicated servers, colocation, and virtual private servers for those looking to scale. Wondering how Mythic Beasts stacks up against other Web Hosting companies? Enter any other Web Hosting company and we will give you a side-by-side comparison.